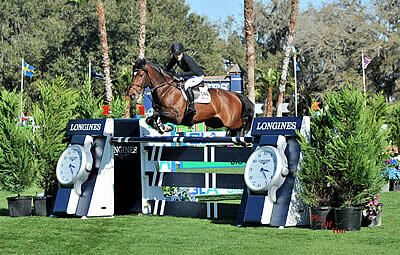 Live Oak International, which takes place from March 9-12 in Ocala, Fla., is unique. It’s the nation’s largest combined driving and show jumping competition, bringing these two disciplines together at a world-class level. This year, Live Oak International will draw about 275 horses from 26 countries, as well as more than 300 volunteers and about 30 competition officials, according to Live Oak International manager Damian Guthrie. Can’t be there in person? Catch all the action live at USEF Network. New to the sport of combined driving? Check out our video intro to combined driving in the Learning Center. While you’re there, go behind the scenes for a show jumping course walk with Olympic medalist McLain Ward. The $100,000 Longines FEI World Cup™ Jumping Qualifier Grand Prix presented by Golden Ocala Golf and Equestrian Club on Sunday, March 12, is the last chance for show jumpers to qualify for the 2017 FEI World Cup™ Finals in Omaha, Nebraska. With only a few remaining U.S. spots open, Charlie Jacobs, Adrienne Sternlicht, Leslie Burr-Howard, Callan Solem, and Todd Minikus will be in hot pursuit of valuable World Cup points with the hope of securing their spot for the World Cup Finals. Meanwhile, the drivers will be contending for US Equestrian Federation national championship honors in single pony, pair horse and pony, and four-in-hand horse and pony divisions. 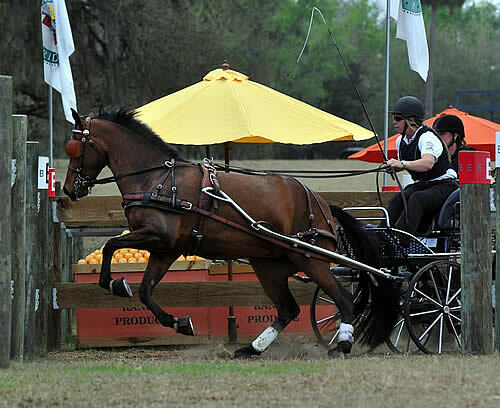 Combined driving’s marathon – which takes place on Saturday, March 11, at Live Oak – is the equivalent to three-day eventing’s cross-country phase, but on wheels, over slightly rolling terrain. Fast-paced and highly technical for drivers and horses, the marathon sends horses and ponies (single, pairs, and in teams of four) through fiendishly complex questions that test teamwork and agility. Two iconic spectator favorites: the CBC National Bank water hazard, which sends teams splashing through a pond as part of the obstacle, and Cape Cod Wood Siding’s The Gulch, with its challenging slopes and turns. Live Oak Plantation, which hosts the competition, is one of the country’s most beautiful properties, with Spanish moss-laden oaks, lush pastureland, and sandy horse paths that seem to lead straight to a bygone era. Live Oak is only open to the public once a year, when it hosts Live Oak International. In the three weeks leading up to the event, Guthrie and his crew transform about 500 acres of cow pasture at the 4,500-acre operation into an equestrian paradise. Live Oak International features about 30 to 40 show jumps and eight available cross-country driving obstacles that challenge competitors and thrill spectators. The transformation involves 100 tents, 300 stalls, and 3,000 decorative plants, not to mention installation of internet and electrical service, all for four days. “Within 10 days after the event, we can turn the cattle back in there again, and you wouldn’t know it had ever taken place here,” says Guthrie. Live Oak Stud, also located on the property, is a renowned Thoroughbred breeding and racing operation owned by Charlotte Weber, whose children Chester Weber (a four-in-hand driving champion himself) and Juliet Reid are co-presidents of Live Oak International. Live Oak International’s shopping and dining area attracts a diverse array of sellers offering everything from saddles to Live Oak International merch to South African excursions to Cuban-style sandwiches. The best way to tour Live Oak? Put on your walking or running shoes and join the Live Oak International 5k on Sunday morning, March 12. The course winds through parts of Live Oak that the public only sees during this event, including the farm’s Thoroughbred racing division and the training barn of world-renowned combined driving champion (and Live Oak International co-president) Chester Weber, whose mother Charlotte C. Weber owns Live Oak Stud. For younger kids and families, there’s a one-mile walk. The flashy black-and-white Express Clydesdales will be performing in the main grass ring at 1 p.m. on Saturday, March 11, and Sunday, March 12. These friendly horses tower from 17 hands to 19 hands tall and attract a crowd wherever they go. Bonus: you can meet them, and they’re happy to pose with spectators for selfies. The backstory: Chloe Reid, 20, has good reason to love the Live Oak venue. The competition takes place on the 4,500-acre Live Oak Plantation in Ocala, Fla. that her grandmother, Thoroughbred breeder Charlotte Weber, owns. Uncle Chester Weber, the 13-time USEF Four-in-Hand National Champion who also will compete in combined driving at Live Oak International, has a training base there. And Chloe’s mom Juliet Weber Reid serves alongside Chester as co-president of Live Oak International. Chloe Reid. Photo Credit: PicsOfYou.com. Rising star Chloe Reid has earned numerous top placings at USEF championships and international competitions. Most recently, she rode on the Hermès U.S. Show Jumping Team that earned a silver medal on the $150,000 FEI Nations Cup at CSIO4* Wellington on March 3. Reid competed in four USEF Junior Jumper National Championships, winning individual gold in 2014, and helped the Zone 3 Young Rider team win gold in 2014 and bronze in 2013 at the Adequan/FEI Young Rider & Junior Championships presented by Gotham North. She earned team gold in the FEI Young Riders Nations Cup presented by Hollow Creek Farm at CSIO Wellington in 2015, and made her senior Nations Cup debut last year at CSIO3* Samorin in Slovakia. Earlier this year, Chloe Reid received the Lionel Guerrand-Hermès Trophy to recognize her as a young rider in one of the Olympic disciplines who exemplifies both sportsmanship and horsemanship. The goal: She plans to bring two horses to the jumping competition: the stallion Codarco and a new gelding, Donald. “Last year I finished second in the grand prix, so I would love to keep that same success in the World Cup Qualifier,” she said, referring to the $100,000 Longines FEI World Cup™ Jumping Qualifier Grand Prix presented by Golden Ocala Golf and Equestrian Club on Sunday, March 12. The backstory: Suzy Stafford (Coatesville, Pa., and Ocala, Fla.) and her Morgan horse PVF Peace of Mind will be trying to clinch their fourth consecutive win in Live Oak International’s FEI Single Horse class – a win streak that has contributed to the mare’s title as US Equestrian’s Combined Driving Horse of the Year in 2016, as well as her award as USEF International Horse of the Year in 2015. “It’s special partly because this is a horse that I own,” Stafford said of “Hunny,” whom Stafford has had since the mare was three and just starting in harness. “I’d like to say we have a great relationship, but you’d probably have to ask her what she thinks! She’s about 15.2 hands on a good day, and there’s a lot of personality stuffed in that little package. She demands a lot of attention, and if she doesn’t get it she can get a little aggravated. She’s quite a bold competitor, and the more atmosphere there is, the more she takes charge. That’s probably why she does well at Live Oak, because there is a bigger atmosphere there than you normally have in the States. Raeford, N.C. – A field of seven talented combinations vied for top honors over the weekend in the 2016 USEF Single Horse Driving National Championship held at the Southern Pines CDE. Suzy Stafford and PVF Peace of Mind led from start to finish to claim their second consecutive National Champion title, finishing on a score of 134.17. In addition to the championship, the CAN2* Single Horse and Four-in-Hand divisions served as Selection Trials for this summer’s FEI World Driving Championships. Sterling Graburn (Paris, Ky.) and his and Laura Corsentino’s Mannkato had a respectable dressage test with a great rein back and wonderful deviations to receive a score of 47.38. Graburn and 2001 Dutch Harness gelding executed a brilliant marathon phase and scored 87.68 after having the fastest times of the day in obstacles one, Cool Breeze, four, the Pine Trees, five, The Bird Bath, and six, The Gates. Their marathon performance allowed them to move up from fourth to third place overall. Graburn and Mannkato had four balls down for 12.00 penalty points in the cones phase to end on a score of 147.06 for third place in the championship. Goshen, Ky. – Suzy Stafford led the field of seven combinations in the 2015 USEF Single Horse Driving National Championship from start to finish with PVF Peace of Mind at the Hermitage Classic CDE, finishing on a final score of 128.97. With three Single Pony National Championship titles (2004, 2008, and 2009) to her name, Stafford claimed her first Single Horse National Champion title. The top three on the leaderboard remained unchanged throughout the competition with Leslie Berndl and Sterling Graburn finishing second and third, respectively, behind Stafford. Stafford (Wilmington, Del.) and her own 2007 Morgan mare began their championship campaign with a beautiful dressage test aside from a few minor bobbles. The Ground Jury of Debbie Banfield (USA), Dr. Klaus Christ (GER), Marie de Ronde-Oudemans (NED), Marsoe LaRose (CAN), and Sarah Mullins (IRL) awarded the pair a score of 40.64 to put them in the lead. Stafford drove determinedly over the tough marathon track designed by Barry Hunter (GBR), overcoming some breaks in concentration from her horse in the busy atmosphere. She and PVF Peace of Mind had a knockdown in obstacle six, and were helped in the marathon phase with their quickness and some luck, adding 86.07 penalty points to their score. They won the marathon phase, having the fastest times at obstacles one and five. The pair expertly navigated Hunter’s challenging cones course, collecting just 2.26 time penalties and finishing second in the phase. Stafford and PVF Peace of Mind’s three solid performances allowed them to remain atop the leaderboard throughout the competition and receive the National Champion honors. Defending champion Berndl (Newcastle, Calif.) and her own Uminco claimed the Reserve Champion title with a final score of 143.01. She and the 2001 KWPN gelding had miscommunications in the trot and canter extensions across the diagonal in their dressage test but showed much expression and great halts and deviations to receive a score of 49.87. In the marathon phase, they struggled at obstacle four and had a knockdown in obstacle five, but redeemed themselves by being the fastest in three of the obstacles, collecting 90.14 penalty points. Berndl drove a fantastic cones course with Uminco with an unlucky ball down at the final cone at 20 for 3.00 penalty points, finishing third in the phase. Graburn (Paris, Ky.) drove his and Laura Corsentino’s Mannkato, who has only been a driving horse for a short time, to third-place honors. Graburn and the 2001 Dutch Harness gelding’s dressage test displayed resistance in a few movements, but had a relaxed walk, powerful extended canter, and nice deviation movements, receiving a score of 52.69. Graburn and Mannkato had trouble at obstacle two in the marathon phase, but finished strongly, tackling the remaining obstacles confidently. The duo tallied 88.71 penalty points and finished second in the marathon phase, with the fastest times at obstacles three and four. In the cones phase Graburn and Mannkato finished within the time allowed but had balls down at 11 and 13 for 6.00 penalty points, ending up with a final score of 147.40. Marcie Quast (Vass, N.C.) and Daphne White’s Halstead by Legacy, a 2005 Hackney mare, won the marathon phase with the only double-clear round in the championship division. They finished in fifth place overall. Find out more about the Hermitage Classic CDE and view results. Coatsville, PA (September 26, 2014) – September in Vermont is always a pleasure as nature paints its first strokes of autumn colors and for spectators to the Green Mountain Horse Association CDE in South Woodstock, there was the added pleasure watching 2013 World and National Morgan Carriage Driving Champion Suzy Stafford demonstrate her champion style by driving to a handy victory in the Preliminary Pony Single division and setting the day’s best Dressage phase score, with a pony debuting in its very first competition. Stafford, driving Margaret Mayer of Ocala, Florida’s five-year-old KWPN/Welsh Cob (Wilson-Lascaux Ginko x Marika) gelding, Micha, established a decisive four-point lead on day one in Dressage, then paced themselves over the Green Mountain State’s verdant hilly terrain in Marathon to sit fourth before returning to the GMHA arena for the final Cones phase, incurring just 1.05 additional penalties to take first in the class and overall standings. They won their CDE division on a total score of 91.56, well ahead of closest challengers Dwayne Pash of New Jersey and Scooter (101.35). “We won our dressage with a 40.67 and that was a good start,” said Stafford, whose career wins also include the 2009 USEF Becky Hart Trophy. “It was the best score of the entire day and this was Micha’s first show. I was extremely pleased how well he handled his first outing. I could not have asked for more from a young, inexperienced pony. Stafford first stepped into the combined driving spotlight in 2004, becoming the youngest and first American driver to win individual Gold in an international driving competition, driving Bouncer to first place in the 2005 World Pony Driving Championships in England. Since then she has collected multiple World and National titles and remains deeply involved in her sport, training, competing and teaching students and holding clinics. 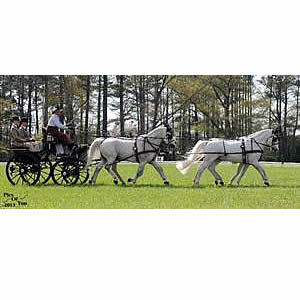 She operates Stafford Carriage Driving facility out of Chester County in Pennsylvania from April to December and in Ocala, Florida from January through April. To learn more, visit www.staffordcarriagedriving.com. Photos courtesy of Jennifer Terrey-Manderscheid. Coatsville, PA (September 24, 2014) – Dubbed “the queens of the Keuring” by the Friesian horse community, Iron Spring Farm’s Evita ISF and Crystal Burr’s Ivanka Nicole performed to crowning achievement in front of the able hands of trainer and driver, Suzy Stafford, at the September 18 FHANA Keuring hosted at Iron Spring Farm in Coatesville, PA.
Stafford took Evita ISF, a five-year-old mare (Ulbert x Tonne Boszorg), owned by Iron Spring, to a driven IBOP performance score of 80.5 to earn the breed’s highest honors, Crowned mare status, and drove Ivanka Nicole, a four-year-old mare (Sipke x Weltsje fan de Lege Gaen), owned by Crystal Burr, to an IBOP score of 78.5 to sweep honors as Crowned mare, Champion mare and Grand Champion of the Day. In the Friesian horse community, the Keuring is an annual inspection of horses traditionally conducted by officials of the Dutch Friesian Studbook of The Netherlands. The IBOP test is open to horses 4 years and older and its objective is to establish a horse’s suitability for various uses and to do so with the greatest degree of objectivity. The driven test consists of a dressage type pattern which includes walk, trot, extended trot and canter. Evita came into the Keuring with “provisional Crown” status, having impressed judges in 2012 when her lovely gaits and conformation were first presented in-hand. To complete Crown status, she needed 75 points or above in the IBOP Driven Performance test. The judges, wowed by, as Stafford described, “her magnificent trot,” scored her 80.5 overall, easily giving the mare the score she needed. The judges reflected their high praise of the young mare’s canter, impulsion and balanced transitions with a score of 78.5. Stafford returned with her later the same day to take her from 2nd Premie to 1st Premie, and assuring her eligibility for Champion of the day as well as consideration for Crown Status. After presenting her to the judges for a more discerning assessment of her trot in-hand work, they were impressed with her overall movement, conformation, elegance and power and agreed to Crowning her. “This is astonishing for such a young mare to achieve this honor,” said Stafford, who add that the mare will continue her training with the multiple World and National carriage driving champion, with the goal of earning the mare’s Driven Sport Predicate. Coatesville, PA (July 25, 2014) – Champion driver Suzy Stafford and her Morgan mare PVF Peace of Mind, also known as Hunny, have a big task before them. Not only do they need to the training, skill and conditioning to compete with the best in the world, but they must allocate the resources to make the journey to the 2014 World Single Driving Championships in Izak, Hungary, September 24-28. Donors to Stafford and Hunny’s cause have different levels of sponsorship, from $50 to more significant contributions, all with added prizes from signed horseshoes and Team Stafford polos to your name on Stafford’s banner at Worlds and a private carriage ride and picnic in scenic Chester County. All donors will also receive a “Hunny Gram” via email starting the week before the competition thanking them for their support and to share Hunny’s European journey. To see a bit of what Stafford and Hunny do in training and to hear about their trip and goals, take a look at their newly posted video at https://www.youtube.com/watch?v=tVAZIgojHVo&list=UUuS0CsciRlY88l9tLrpGnBw. To donate, and for more information on their trip, visit https://www.indiegogo.com/projects/help-hunny-and-suzy-get-to-the-2014-fei-world-driving-championships. 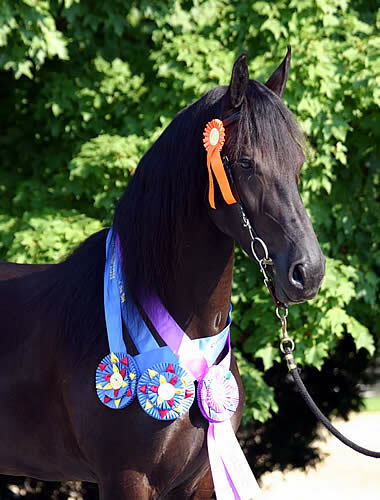 With a record of victories that includes winning a FEI Live Oak International CDE and the title of World Champion in both Morgan Carriage Driving and Friesian English Pleasure, Stafford has a long history of success as a driver. In 2004, she became the youngest and first American driver ever to win Individual Gold in an international driving competition. Stafford operates her Stafford Carriage Driving facility out of Chester County in Pennsylvania from April through December and is stationed in Ocala, Florida from January through April. 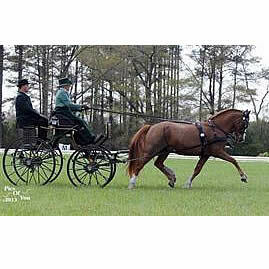 To learn more about Stafford and Stafford Carriage Driving, visit www.staffordcarriagedriving.com or call (302) 540 5162. Raeford, N.C. – The marathon phase of the USEF National Single Horse Driving Championship, which is being held in conjunction with the Southern Pines CDE, proved to be a back-and-forth battle between two of America’s most experienced drivers. Leslie Berndl and Suzy Stafford traded quick times through Richard Nicoll’s eight-obstacle marathon course on a picturesque day at the Carolina Horse Park. While Stafford was able to capture victory on the marathon, it is Berndl who will drive last in the cones as the leader of the National Championship at the conclusion of two phases of competition. Berndl (Newcastle, Calif.) and her own 13-year-old KWPN gelding, Uminco, headed onto the marathon with the overnight lead after winning the dressage with a score of 34.24, and a 4.65 lead over Stafford. The 2013 USEF National Single Horse Driving Champions posted competitive scores throughout each hazard including driving the fastest time in obstacle two and placing second in obstacle four. Additionally, they continued their pursuit to back-to-back titles by driving the third quickest times in obstacles one, five, six, seven, and eight on their way to finishing the marathon on a score of 79.43 in second place. Berndl heads into the final cones phase on a total score of 113.67, giving her more than a three-point cushion over the field. Stafford (Wilmington, Del.) and her own PVF Peace of Mind currently stand in second place in the Championship with score of 117.35. The three-time USEF Single Pony Champion, utilized her vast experience with the seven-year-old Morgan as they won the first and third obstacles, and posted second-place scores in obstacles five, six, and seven. On their way to winning Saturday’s marathon on a score of 78.76, the Live Oak International winners also placed third in obstacle four. Kate Shields (Middleburg, Va.) held her third place overall standing with her own 13-year-old Welsh Cob gelding, Hastening Winslow, on a two-day score of 138.78, after placing seventh on the marathon with a score of 95.64. Championship competition comes to a close on Sunday with the cones phase. To learn more about the Southern Pines CDE, visit: http://www.carolinahorsepark.com/events/driving/2014/4/southern-pines-combined-driving-event-national-single-horse-championship. Ocala, FL (March 25, 2014) – Suzy Stafford believes in starting horses young and correctly. That’s why she’s excited about the USEF Young Horse Championship and Festival, held at the Kentucky Horse Park in the fall of 2014. The USEF Young Horse Championship and Festival showcases and identifies the best young horses in the United States in dressage, driving, eventing, and hunter/jumper. The event promotes American-bred horses and features a competition hosting horses ages four through seven years, and in-hand evaluations by a panel of experts for yearlings to three year olds. The goal is to provide educational opportunities regarding breeding and development of young horses. 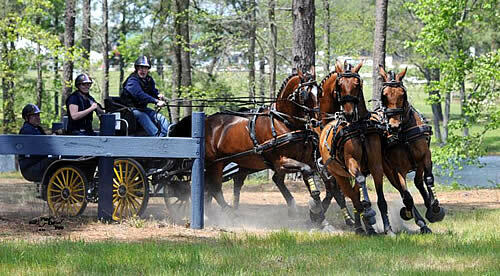 The inaugural show for this program was held February 20-23 at the Florida Horse Park in Ocala. Stafford was named to her tenth USEF Long List since 2000, and she drove two horses for their owners in this developing program. Stafford brought home the win with the 4-year-old KWPN Dutch gelding Funnominal C.G., owned by Carol Ann Gross. In 2004, Suzy Stafford stepped into the world spotlight as the youngest and first American driver to win individual Gold in an international driving competition, driving the Welsh gelding Cefnoakpark Bouncer to first place in the 2005 World Pony Driving Championships in England. Since then she has collected countless World and National titles and remains deeply involved in her sport, training, competing and teaching students and holding clinics at her Stafford Carriage Driving. Suzy Stafford’s interest in horses began at a young age. She rose through the ranks of United States Pony Club, where excelling in combined training. In 1998, she completed American Riding Instructors Program certification in dressage and combined training. After a leg injury ended her riding career, she channeled her competitive drive towards a new equine sport: carriage driving. In 2001, Stafford began working with seven-time United States National Pair Combined Driving Champion Lisa Singer and took every opportunity to work with many different breeds in both pleasure showing and combined driving. Stafford soon became Singer’s assistant trainer and honed her skills to become a noted trainer, instructor, and clinician. Stafford now competes on the national and international stage, and has added many championship performances and medal finishes. Staying at the top of one’s game means working with the best, and Stafford has trained with many world champion drivers. Setting a solid foundation of basic skills for students is a priority for Stafford, who helps them gain confidence and proficiency. Teaching at her two training locations, Aiken, SC, and Coatesville, PA, as well as traveling to clinics and giving seminars, enables her to share her knowledge with other driving enthusiasts and competitive drivers. Stafford operates her Stafford Carriage Driving facility out of Chester County in Pennsylvania from April to December and is stationed in Ocala, Florida from January through April. To learn more about Stafford, visit her website at www.staffordcarriagedriving.com. Ocala, FL (March 20, 2013) – The 2014 Live Oak International is underway, bringing the best competitors in show jumping and combined driving to Live Oak Plantation in Ocala, Florida. The prestigious competition, considered the premier combined driving event in North America, was favored with flawless weather and a strong showing of appreciative spectators as the equestrian extravaganza began. Wednesday opened with FEI Horse Inspections for the Combined Driving Event (CDE) whose modern roots trace to 1968 when Britain’s Prince Philip, then-president of the Federation Equestre Internationale (FEI), initiated the formulation of international rules for a sport performed by countless generations around the world. The first phase of the CAI Live Oak International kicked off Thursday morning at 9am with the FEI driven dressage (from the French word, ‘to train’) that tested each driver and team with a prescribed sequence of movements, driven from memory, and executed within the parameters of lettered markers around the arena. “Today was great sport and I have high hopes for the rest of the weekend,” said Chester Weber. Facing a roster of challengers from the United States and Canada, defending Four-in-Hand champion Weber is seeded first (78.1%) in the FEI Four-in-Hand Horse USEF National Championship sponsored by Ariat with a better than 10-point lead ahead of closest contender and last year’s Pair Horse champion at Live Oak, Misdee Wrigley-Miller (67.5%). Proving once again why his crisp presentation and accuracy have earned Weber the nickname, Mr. Dressage, judges Skar, Turbe, Counsell, Nicoli and Christ all scored him handily (35.02 points) for this first of three deciding phases. USA driver Suzy Stafford leads in the FEI Single Horse division, with a 74.3% top score ahead of closest contender, Leslie Berndl’s (USA) 71.9%. Stafford trained for a career as a dressage and combined training instructor before a leg injury ended her riding career but became a boon to American combined driving. In 2001, she began working with seven-time US National Pair Driving champion Lisa Singer and has since become one of the most respected lady whips in the world, as well as a top contender for Live Oak’s Single Horse driving crown. During the lunch break, the Budweiser Clydesdales put on an impressive display with their six-in-hand, a remarkable spectacle that will be repeated on Saturday before the $50,000 Live Oak International CSI**-W Grand Prix. Ten-time National Four-in-Hand champion, Chester Weber, who is hosting the equestrian extravaganza at his family’s Live Oak Plantation, was first introduced to driving taking the reins of Clydesdale horses. USA drivers currently seeded first include Tracey Morgan, who leads (70.5%) the FEI Single Pony sponsored by Hillcroft Farm; Boots Wright leads in Intermediate Pair Pony (74.3%). Wiebe Dragstra is at the top in the Intermediate Pair Horse (73.3%), as is Steve Wilson and his Lipizzaners in the FEI Pair Horse (67.6%). Germany’s Carola Slater-Diener closes the first day of competition as its highest-placed international entry, leading (64.7%) the FEI Pair Pony, sponsored by Hillcroft Farm, ahead of US driver Jennifer Matheson (64%). As glorious as any competing team was the special lunchtime appearance of the stars of the Super Bowl TV commercials: the Budweiser Clydesdales. More than 16 tons of groomed horses and gleaming tack, hitched to a vintage Studebaker beer wagon, drew waves of fans of all ages as they effortlessly figure-eighted their way around the arena. Thursday will open with the FEI Horse Inspection for show jumping horses and the Driving Marathon Course Inspection, followed by the Competitor’s Welcome event at 6pm. Friday promises to be a day of exciting competition, offering the Intermediate Driven Dressage, the $5,000 1.30m Joan Pletcher Realty Power and Speed class, and $10,000 Waldron Wealth Welcome Stake. Admission is $10 at the gate for adults and $5 for seniors and children under 12. It is strongly recommended that spectators bring lawn chairs. Concessions and a Vendor Village will be open during the entire competition. Tailgating is available for the Driving Marathon Saturday. To reserve a tailgating space contact 352-207-3615. For more information on Live Oak International, including a full schedule of events, visit their website at www.liveoakinternational.com. Listen to live radio broadcasts on Friday morning, 9:30-11 a.m. on WOCA 96.3FM/1370AM and Saturday morning, 8-9 a.m. on NBC Sports Radio 100.1FM/900AM.